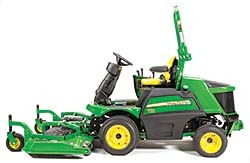 The 1500 series TerrainCut™ consists of five models — 1550, 1570, 1575, 1580, and 1585. Horsepower (hp) options for the models range from 24.2 hp for the 1550 model to 37.4 hp for the other four machines. Each machine includes a 7-Iron™ Pro side-discharge deck or a Fastback rear-discharge deck that comes standard with flat-free, semi-pneumatic caster tires. The machines offer four-season capability, with attachments available for blowing snow and sweeping streets and walks.